"Remember our trip to the moon, Max?" 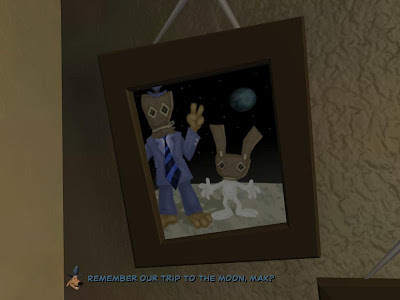 This picture of Sam & Max on the surface of the moon wearing paper bags on their heads as helmets is on the wall in their office. It refers to the comic "Bad Day on the Moon", which was also adapted into an episode of the Sam & Max: Freelance Police cartoon series.